While the characters and situations in The Scientists are fictional, most are (very loosely) based on real scientific figures and events. 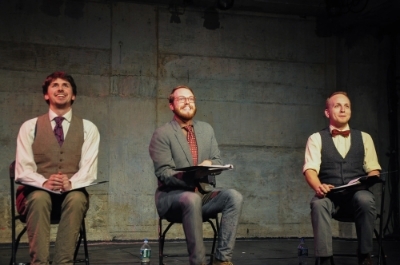 The play was first conceived as a 15 minute piece that was performed at Theatre In Aslyum's "Death/Memory Project", a cabaret night of drunken debauchery held at New York Theatre Workshop in March of 2011. After the success of this initial incarnation, we were so enamored with this ragtag bunch of scientists and the process that created them that we wanted to give them a life beyond those brief 15 minutes. We set to work and expanded the short into a full length version, which received a reading at the Living Theatre hosted by Perf Productions in December of 2012. With the feedback we received from our reading, it was back to the drawing board as we continued to work on the script, tweaking, reimagining, and fleshing out each moment to create the full story of these three lovable buffoons we had dreamed up. Now The Scientists are hitting the road as we bring the show to audiences around the country! Check out a performance near you!